Greece has received unprecedented migrant arrivals over the past few years, being at the frontline of entry into the European Union. 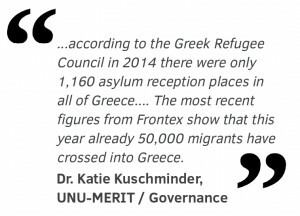 The EU’s Frontex agency has just released new figures showing that the Turkey-Greece border has again become the primary mode of entry into the EU, writes Dr. Katie Kuschminder. In May 2015, I interviewed several migrants, including recent arrivals to Athens on their experiences, future plans, and aspirations as part of the Irregular Migrant Decision Making Factors in Transit project, funded by the Australian Department of Immigration and Border Protection and the Australian National University’s Collaborative Research Programme on the International Movement of People. Most of these migrants had arrived in Greece on the eastern islands and after spending between one to three days in reception there on the islands, they were transferred to Athens. Although there are no official statistics, Athens receives multiple arrivals daily. People are arriving from the islands, the north via land routes, and in May, the government was releasing people from detention centres who also came to Athens. Based on Greek law, the authorities should take measures to provide accommodation and reception to asylum seekers. However, according to the Greek Refugee Council in 2014 there were only 1,160 asylum reception places in all of Greece. Most of these facilities are run by NGOs often with specific mandates for unaccompanied minors or families. The most recent figures from Frontex show that this year already 50,000 migrants have crossed into Greece. Clearly, these are not all asylum seekers; however, the gap between reception facilities and migrants seeking asylum is significant. While in Athens, I visited one of the largest reception centres in Lavrion that’s run by the Red Cross. According to sources at the centre, the Red Cross staff at the facility haven’t been paid in over a year, illustrating the financial difficulties that they’re facing. The migrants at the centre weren’t satisfied with the conditions, particularly because they didn’t receive assistance for health care. Most commonly migrants either receive funds from abroad or pool money between families to pay for medical services when someone is ill or injured. Further, the centre was operating at overcapacity. People in need that arrive at the centre were accommodated by the migrants with multiple families sharing one room. Despite these frustrations, these migrants were fortunate to have accommodation and regular access to food. The services available for asylum seekers, refugees, and migrants with temporary protection in Greece are strikingly different from other European countries. It’s not surprising that in a country experiencing one of the most critical economic crises in the world, there is limited ability to provide government services to asylum seekers and refugees. Whereas an asylum seeker in a country such as Ger many, the Netherlands, or Switzerland would receive accommodation and three daily meals at reception centres, asylum seekers in Greece are left to their own devices. Similarly, refugees and those with temporary protection in other European countries would be entitled to social benefits, but in Greece it’s simply not possible for the government to make such provisions. As a result, migrants with access to resources reside in hotels or irregular hostels (apartments or hotels where beds are rented to migrants by the night for a cost often as low as €3). The more fortunate are able to get an apartment, whereas the less fortunate are sleeping on the street. NGOs struggle to provide services such as food and accommodation to people in need but aren’t able to reach all of the arrivals. Asylum seekers express frustration at the lack of support and services that they receive. People are clearly struggling for their basic necessities and finding their way in Athens. 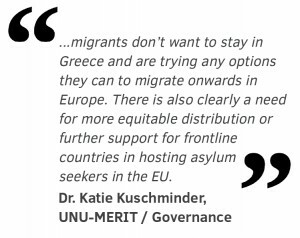 Within this context, it’s understandable that most migrants don’t want to stay in Greece and are trying any options they can to migrate onwards in Europe. There is also clearly a need for more equitable distribution or further support for frontline countries in hosting asylum seekers in the EU. This post was first published on the Border Criminologies blog, University of Oxford. The Irregular Migrant Decision Making Factors in Transit project has been funded by the Australian Department of Immigration and Border Protection and The Australian National University’s Collaborative Research Programme on the International Movement of People. The views expressed in this post are those of the author and do not necessarily represent those of the Department of Immigration and Border Protection. The results of the study are expected in 2016.